I would have liked for Mr PugRunner to join me. It was going to be cool enough that it would have been good to clear his sinuses, and I thought he could just walk a bit and then we could have a breakfast date afterwards. However, when the alarm rang, he didn’t budge, so I packed my things and headed out by myself. Honestly, I could not have asked for better weather. The sun was shining and the temperature never rose above 60*F. It was a little windy, but it always is by the beach. What I could not prepare for was my body’s emotional response to the bridge. I haven’t run a bridge, hill or anything more impressive than a speed bump since the Gate. And while I loved that race, and have a lot of great memories from it, my body apparently disagrees. As I started my way up, I noticed my breathing was getting more and more shallow, and I wasn’t able to catch a good breath. It felt like when I started hyperventilating at the end of the Florida Striders Memorial Day 5K last year, when I just got completely overwhelmed by everything. It was awful. I was about 3/4 of the way up the first side of the bridge when I had to slow to a walk, take a moment to focus on filling my lungs and get my head together. Fortunately, the view makes it easy to relax. I resumed my journey to the top of the bridge and then let myself go on the way down. Rather than turning and starting back up again, I gave myself a chance to relax by running the boardwalk that winds under the bridge. It’s a little quieter and a bit more nature-y, so I was able to give myself a chance to recover. Then it was back up. The shortness of breath didn’t go away, so I built in little intervals for myself (run for two light poles, walk for one, run for three, walk for one). It gave me something on which to focus and helped me feel better. I like to run the bridge 2 1/2 times on a regular day. It puts me at a little over 4 miles, and I can push myself while doing it. On this particular day, I gave myself permission to take my time. When all was said and done (my Garmin was on low battery, so I used it for half the run and then switched to RunKeeper for the rest), I managed 4.33 miles at a 12:00 pace. Not too bad for the first time back, and I realize I have missed the change of scenery. I will definitely be working this back into my training routine. I need to get over my mental wall and I need to have some new things to look at as I get working on my longer runs. Have you ever been sidelined by a mental or emotional response to a run or workout? How do you cope and get past it? That bridge is on my list! I want to run over it because it just seems so pretty. I think I may be addicted to bridges. It is beautiful. And it’s a good height and steepness. Plus, it connects to the beach and also through some of the St. Aug neighborhoods, so you could build it into a long run through historic downtown, if you were so moved. I think it’ll probably be a long run one day that ends in a beach day. The weather really was fantastic in the mornings this weekend! I had a great run Saturday AM. It does. And you’re right. I’ve been trying to take it easy these last few months, but it’s time to start getting serious again! Ack! well done…. I went out for a longer (4) mile run yesterday… my breathing was very unsettled until I got to 3.5…. then it settled in and I was able to finish strong. So yea for us, that is a very pretty bridge. Keep up the great work. You, too! It’s so hard when you know you can do certain things, but your body just shuts it down. That bridge has a beautiful view. I think the more you run it the more confident you will become. It’s one of my favorite places to run. This looks like such a beautiful route. I hope the bridge runs get increasingly easier for you. Meranda@fairytalesandfitness recently posted…What’s the difference between your Greek Yogurts? That sounds like a really awesome run! I’m trying to be well-rounded in my training. It’s tough but I know it will be for the best in the long run. 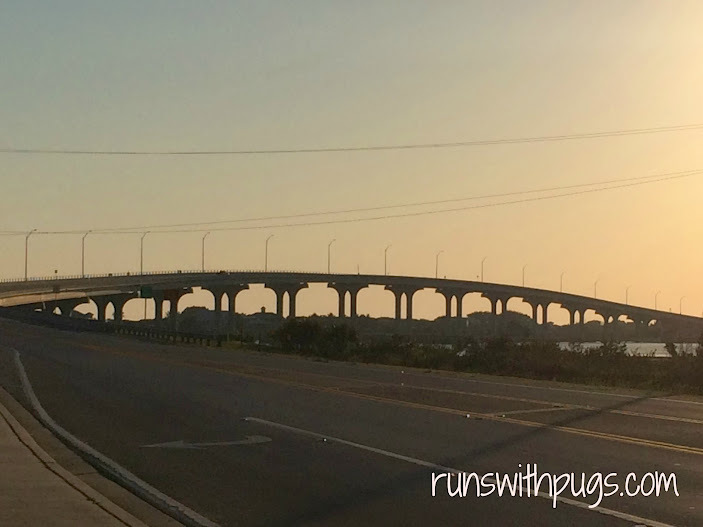 Glad that you got out for such a beautiful run, and good for you for tackling that bridge! Keep it up and it will seem easy, or at least easier! I’m working on it! It’s hard to battle those mental demons sometimes. Lovely view! I need some hills in my life. The desert is not flat but the city is and I feel like if I were to tackle hills right now I would crawl up not run.